My brother in law set a Christmas Cooking Challenge; Who can make the best macaroons! My mother in law and I each made a batch of macaroons and the rest of the family judged them on Christmas Day. My brother in law ducked out of the competition in the end – although we were treated to his macaroon-ish roulade on 27th! As predicted it was all a ruse so Peter could consume macaroons at Christmas! The day before, age the egg whites; Separate the egg whites and put them in an air tight container in the fridge for 24hrs. Firstly make the ganache; Gently heat the cream in a small pan until it’s just beginning to boil, then take it off the heat and add the chocolate. Leave it be for a couple of minutes, then stir until combined and smooth. Gradually beat in the butter and add a pinch of salt. Leave to set. Make a macaroon template; Cut two pieces of baking paper to fit the baking tray, use a glass or pastry cutter about 3.5cm in diameter, cover one piece with black marker pen circles spaced about 2cm apart. Put this on the baking tray and cover with the other piece of baking paper. Use a piping bag with a 1cm nozzle. Blitz the ground almonds in a food processor for a couple of minutes, then sift them, the icing sugar and cocoa into a bowl. Sift again, so it’s all well mixed. Put the egg whites and a pinch of salt into a bowl and whisk. As soon as the whites begin to hold their shape, whisk in the caster sugar and continue whisking until you have a stiff meringue – you should be able to hold the bowl upside down without the meringue falling out! Fold in the dry sifted ingredients and then beat the mixture until it falls off the spatula. Don’t worry about beating the air out of it, you don’t want too much trapped in the shells. Spoon the mixture into the piping bag and carefully pipe on to the circles. Pick the baking tray up and drop it on to the worktop a couple of times, then leave to rest for about an hour (longer if the room isn’t warm) until the macaroons feel dry to the touch, they should not be sticky. Meanwhile, heat the oven to 180C / Gas mark 4. Bake the macaroons on the top shelf for about 17 minutes until firm, opening the oven door a few times during cooking to let off any steam. Once you’re sure they’re cooked, slide the baking paper off the tray onto a wire rack immediately to stop the macaroons cooking. Cool completely on the paper, then carefully peel off. 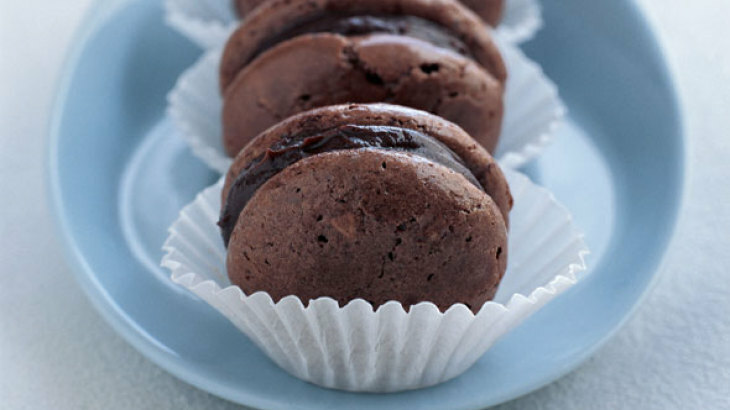 When cool, match up equal-sized macaroons, and using a small palette knife or spoon, sandwich them together with ganache. Refrigerate for 24 hours, then serve at room temperature. Then tuck in – Delicious!! Gallery | This entry was posted in Recipes / Food and tagged Baking, Chocolate, Chocolate Macaroons, Food, Macarons, Macaroons, Recipe, Treat. Bookmark the permalink.